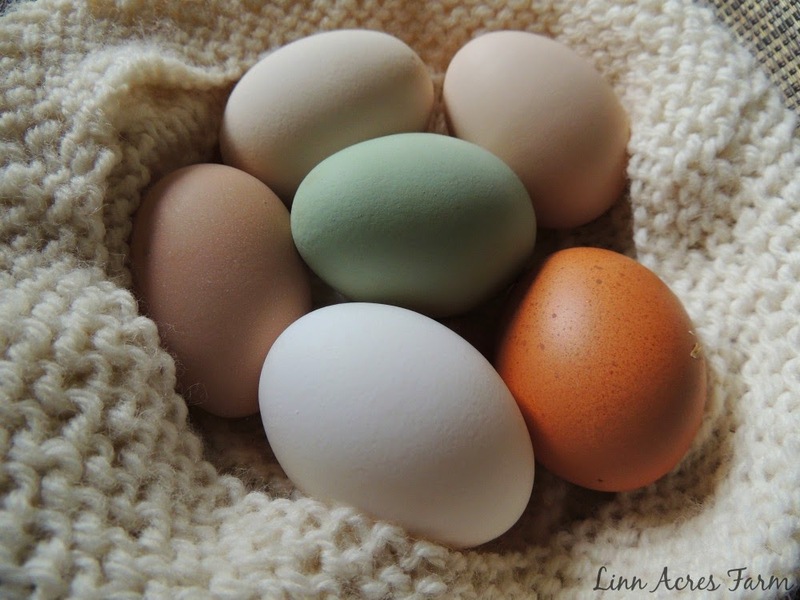 Linn Acres Farm: Why do Hens Sing the Egg Song? 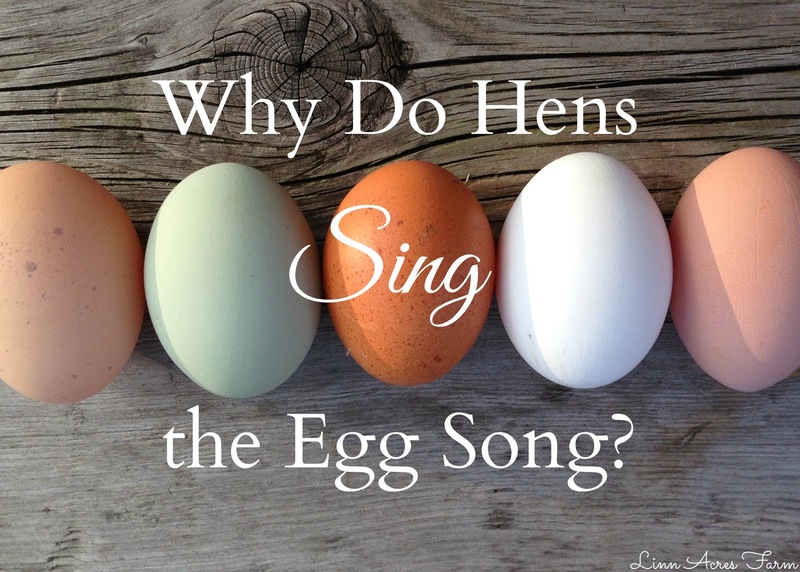 Why do Hens Sing the Egg Song? For those of us that keep chickens, the egg song is a wonderful sound. 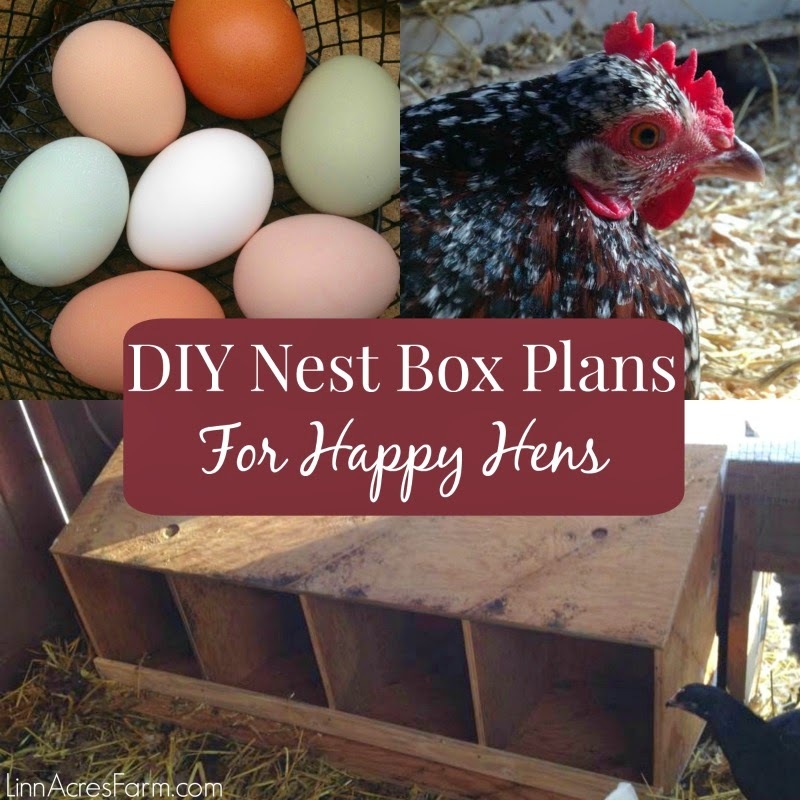 It means that your chickens are happily laying you some delicious eggs! For those of you that don't keep chickens, you are still most likely familiar with the sound. The "bawk bawk bawk ba kaw" sound that many people associate with chickens is in fact, the egg song! If you have never heard the egg song before, scroll down to watch a video of one of our barred rocks, or watch it on youtube here. Most people do not realize quite how vocal chickens are until they spend some time with them. They aren't only vocal when they lay their eggs, they also make sounds of purring, growling, predator warnings, squawking, calling chicks to food, quieter clucking to each other and of course roosters crowing. Certain breeds are more talkative than others and some chickens are louder or quieter depending on their personality. There are certain sounds I recognize from my flock to mean certain things. If one of them is unhappy about something, they will let us know. 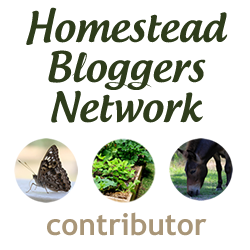 Both the rooster and the hens make a certain sound when a hawk is flying overhead. If one of them gets startled by something, you'll hear it! Our rooster is always calling the girls over for some yummy treat he has just discovered. Hens will sing the egg song after they have laid an egg. Or join in after someone else lays an egg. Sometimes the whole flock will all join in together singing the egg song! So why do they sing? There are a couple of opinions on why. The first is that the chicken is proud and happy that she has laid an egg and is announcing it to the rest of her flock. Any chickens nearby may join in on the celebratory song! The second reason is by singing the egg song, she can call to the rest of the flock, who may be out of sight, and they can find each other. I have certainly seen our girls come out of the coop in search of the rest of the flock who are out of sight. Either way, it's a happy sound! Thanks for sharing, now I don't have to wonder what exactly an egg song sounds like anymore. I always wanted to know. Glad you enjoyed hearing it! :) One of my favorite sounds! Oh my, I never knew this! Does every hen do this every time she lays an egg? I am wondering if my future urban chickens are going to be a bit louder than I thought? At any rate, that sound brought back instant memories of being at my grandma's house. :) Forgot the sound until I heard it again. my current rooster sings the egg song when his ladies have laid their eggs! It seems to me to be counter-productive to advertise to predators that you've laid an egg, or someone else has! it doesn't make sense from a bird behaviour point of view. I'd be interested to know if this occurs in the original two species hens derived from. Maybe the idea is to distract attention from the egg to the hen - which can fly away. Hens usually look for somewhere secret to lay. It's certainly a very annoying trait, especially to neighbours!